I’m going to take you through my editorial illustration procedure, from my thought process to the final artwork, of one of my editorial illustration jobs. 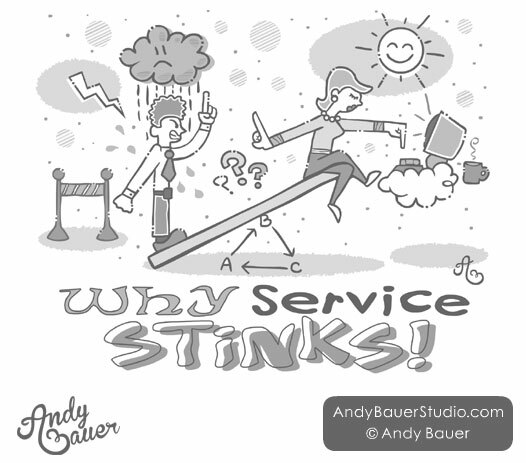 “Why Service Stinks” is an article about how consumers feel less valued and frustrated by the corporate push for profit and productivity rather than customer satisfaction. After doing some pondering, I sketched four rough concepts to send to my client to demonstrate my ideas. The first idea I had was to have a consumer and a customer-service rep standing irked back-to-back, while sharing an angry swirl above their heads in equal frustration. Each character is surrounded by icons that represent their individual frustration. On the left, the consumer is surrounded by a “take one” ticket distributor and a clock to represent the irritation of waiting as well as paperwork to represent an unnecessary and incidental runaround. On the right, the customer-service rep is surrounded by annoying, noisy electronics and a delete button to symbolize the desire to make it all go away. The bar at the bottom represents caution tape to signify a troublesome situation. 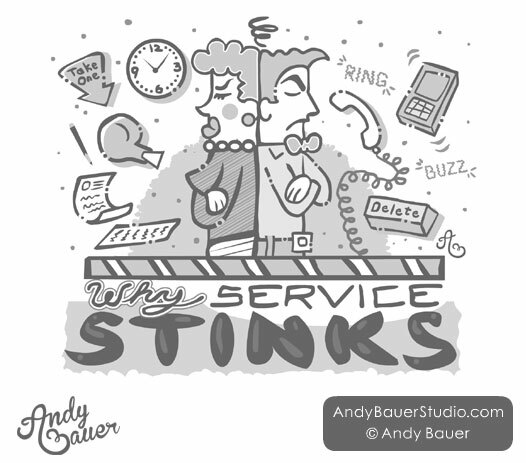 The second idea I had was a more literal take on the title “Why Service Stinks”. 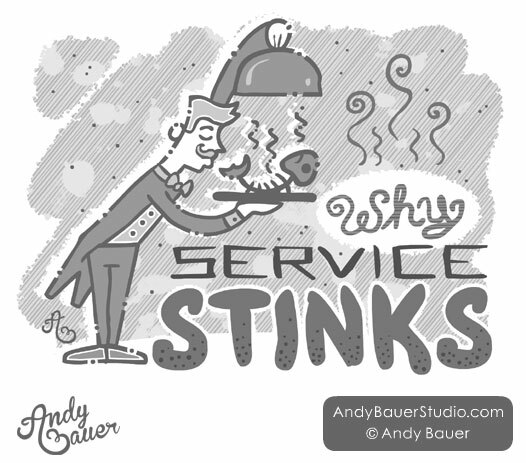 Visually, the word “service” brought to mind a butler character while the word “stinks” conjured an image of a dead fish. 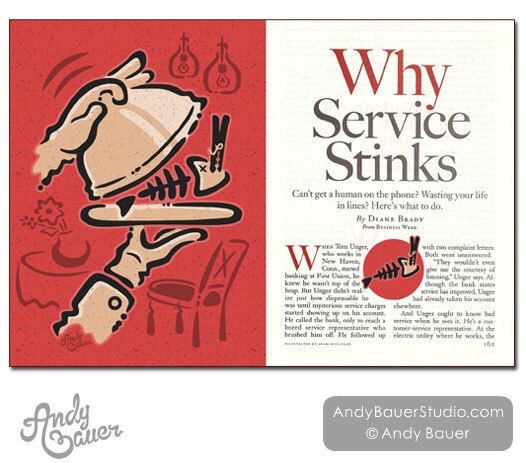 So, I simply put the two together and sketched a butler dishing up a smelly dead fish. The odor swirls are similar to question marks to depict the question, why. 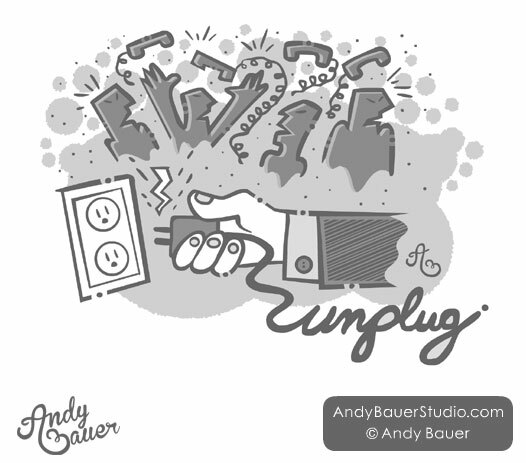 The next concept portrays the large hand of Corporate America’s disconnect from the consumer and unplugging from the long lines and frustrating telephone trees as demonstrated by the angry crowd with phones in the background. The fourth idea’s focus is on unbalance. The angry consumer on the left, who is also standing near crowd control stanchions from having to wait in line, is tipping the scale to demonstrate the volume of consumer needs, while at the same time, consequently, lifting up the costomer-service rep who appears to be higher up to demonstrate the feel of a more important rank. The balance beam is supported by an ABC triangle that demonstrates the vicious cycle in which both parties are going in circles. The angry consumer is burdoned with a sad rain cloud and thunderstorm pouring down on him while the customer-service rep appears to be on cloud 9 in the happy sunshine as she is using one finger to tell him to wait. Notice she is seated while he is standing. And she also seems to be enjoying a cup of coffee. She’s clearly in no hurry. This is the vision the angry consumer has of the service rep. I email the roughs to the client and the chosen direction for this project was concept #2. 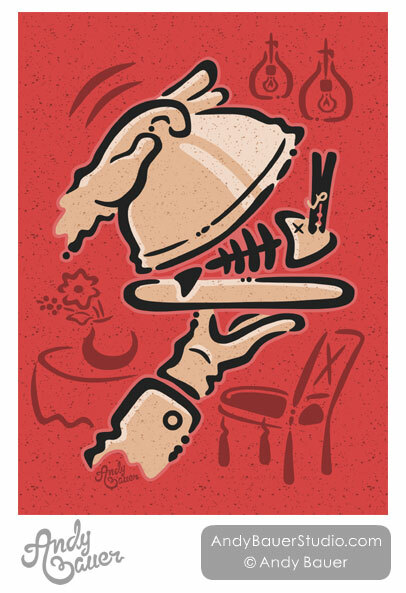 I receive feedback from the Art Director to just illustrate a close-up of the butler’s tray. In this case, the Art Director said a new sketch wasn’t necessary. So, I ink and color the modifide selected concept. After inking and coloring the illustration, I email the artwork to the Art Director for approval. For this article a spot illustration was needed. The Art Director thought the fish alone would suit the article well. I email the high resolution illustrations to the Art Director to be laid out in the article. Here is the final article with the illustration and spot illustration. This entry was posted in Editorial, Illustrations, Process. Bookmark the permalink.